Olixar puts innovative gadgets into the hands of tech-loving consumers across the globe with products featured in Wired, The Gadget Show and on Unbox Therapy. Olixar chose Magento 2, an eCommerce platform to match their fast-paced innovation. The prioritised requirement for the branding was to be unique, simple and recognisable. In turn, this would help create instant recognition, with a special focus on colour and typography. Careful consideration was also made to how it would be applied across an array of different mediums including on Amazon, products, packaging and national exhibitions. 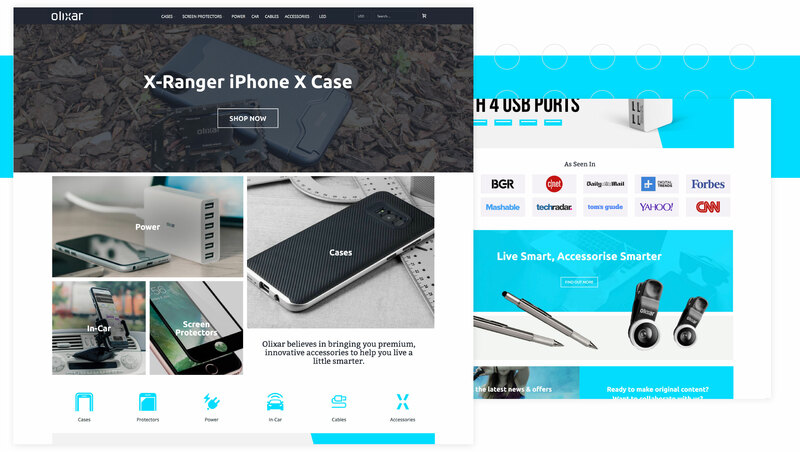 Olixar has made a name for itself in the premium phone accessory game by delivering stand out products in an incredibly saturated market and needed a site to match. The choice of Magento 2 provided the opportunity to create a bespoke integration with an in-house stock management system, as well as multi-currency set up, and multi-channel listings on marketplaces such as Amazon. 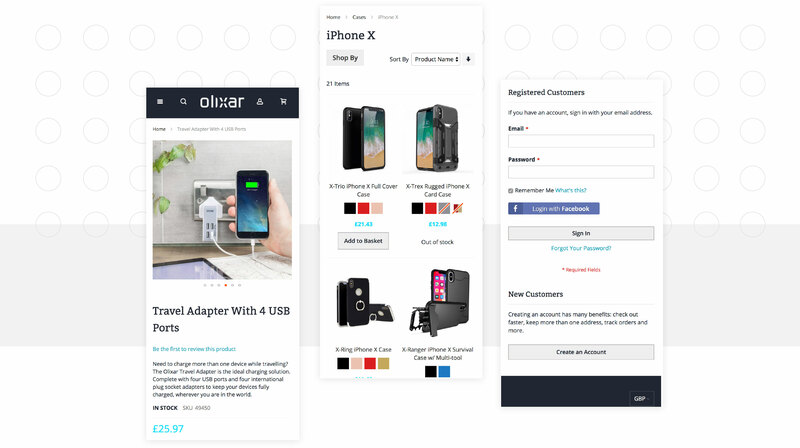 With Olixar’s entire demographic being related to mobile in some way, building the website had to take a mobile-focused approach that could be scaled up to any device. Outside of general touch-friendliness with regards to menus and navigation, key attention was paid to smaller details such as colour swatch size and a clean, modern interface. Having a key emphasis on streamlining the process for everyone from customer to dispatcher, several bespoke elements were implemented for Olixar on top of out-of-the-box Magento functionality. Olixar use an in-house stock management system that needed to communicate with Magento through every step of the order process. While Magento handles the eCommerce side of things such as payments, orders, and confirmation emails, the stock levels, product information and shipment status are managed by Olixar’s ERP. As Olixar wanted to expand and get their products in front of as many people as possible, the choice of pushing into marketplaces such as Amazon became an easy one. magic42 installed and configured M2EPro in order to serve Olixar’s multi-channel desires with as little day-to-day hassle as possible.